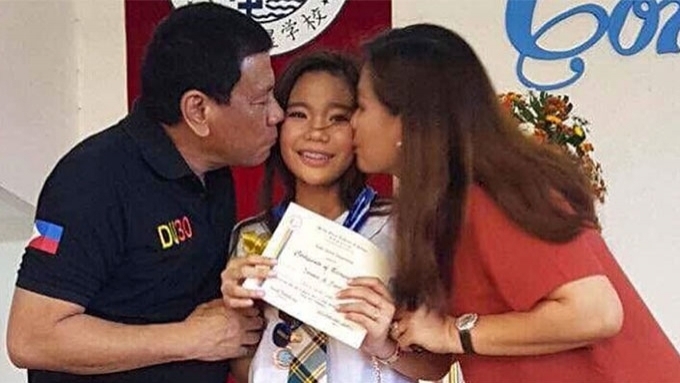 President Rodrigo Duterte and longtime partner Honeylet Avanceña gave their daughter Kitty a sweet kiss on the cheek during the latter's graduation rites at Stella Maris Academy of Davao today, March 25. President Rodrigo Duterte may be swamped with his meetings, speaking engagements, and trips, but he took time off work for some #daddyduties. Today, March 25, the president attended the graduation rites of his daughter Veronica "Kitty" Duterte at Stella Maris Academy of Davao. Kitty is President Duterte’s daughter with his longtime partner Honeylet Avanceña. The proud parents were even caught on cam giving Kitty a kiss as she accepted her grade school diploma. In his speech yesterday, President Duterte reiterated his love for his children. “That is really what happens if you have two wives.